The Diablo Symphony serves the community in a wide variety of ways. In our “Music for the Schools” program, members of the Diablo Symphony are available for school assembles tailored to a variety of levels, from fourth through eighth grade. The program can be adjusted to fit within time and space requirements at your school. We are now in our second year of this highly successful program. Please contact [email protected] for more information. The Diablo Symphony performs concerts suitable for the whole family, both in the regular season and as special events. 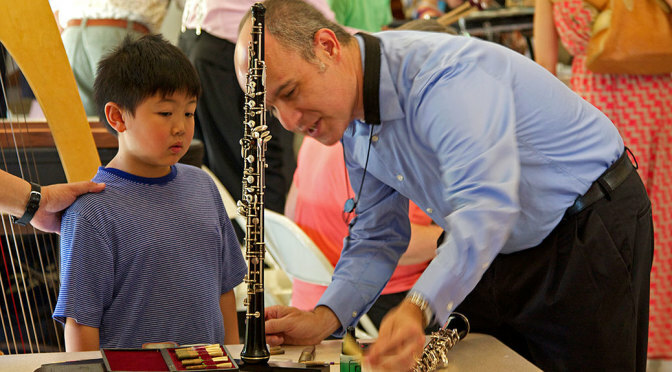 This year the very popular Instrument Petting Zoo and Family Concert returns. Family members of all ages are encouraged to come and try out different instruments and see which they like best! Admission to both the Petting Zoo and the concert is free. We provide concerts for the Rossmoor senior community by performing at venues there for easy accessibility to great music. Every year, we provide the opportunity for a talented young musician to perform a concerto with the Diablo Symphony through our Yen Liang Memorial Young Artist competition. You can also find the DSO bringing classical music to Walnut Creek and surrounding communities in a variety of other ways. Look out for the DSO at the Farmers’ Market and other locations.